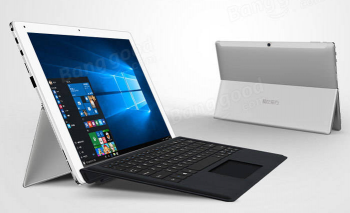 This dual boot, Android/Windows 10 computer/tablet lets you choose your favorite platform. The Cube iWork12 Tablet comes with Intel Cherry Trail Quad Core Z8300 1.44GHz-1.8GHz CPU processor and Gen8-LP10/12EU up to 600MHZ GPU.Adopts Windows 10+Android 5.1 System and 4GB RAM+64GB ROM,The 12.2 Inch 1920*1200 Resolution IPS Capacitive Screen brings you perfect visual enjoyment. Supports HD/Bluetooth function. Only 219.99 with free shipping.